Roughly three-in-ten online adults (29%) — and 36% of smartphone owners — use messaging apps such as WhatsApp, Kik or iMessage. These apps allow mobile users to message one another without using up SMS data, which is required when exchanging traditional text messages. Some of these messaging apps, such as iMessage, maintain conversations even if a user switches between devices, such as a tablet, laptop or desktop computer, or cell phone. Messaging apps are especially popular among young adults. 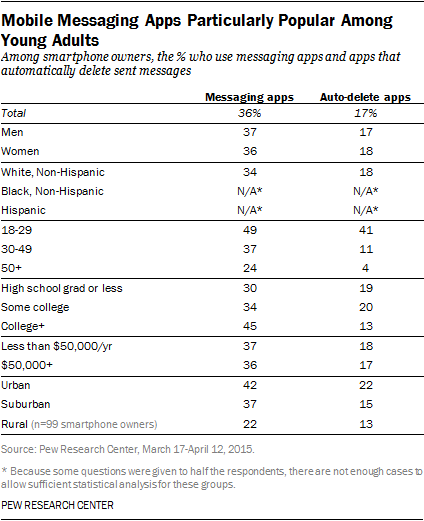 Among smartphone owners ages 18 to 29, 49% use messaging apps. However, these apps are relatively popular with older smartphone owners as well: 37% of smartphone owners age 30 to 49 and 24% of those ages 50 and older use mobile messaging apps. In addition, 14% of online adults — and 17% of smartphone owners — use apps that automatically delete the messages they send, such as Snapchat or Wickr. These ephemeral messaging apps hold particular appeal to younger smartphone owners: Fully 41% of smartphone owners ages 18 to 29 use these services, compared with just 11% of smartphone owners ages 30 to 49 and 4% of those 50 and older. These types of discussion sites are relatively popular among young adults – 23% of those 18 to 29 say they use online discussion forums. In addition, online men are more likely than online women to use discussion forums (20% vs. 11%). One-in-ten online adults (10%) use Tumblr, a slight increase from the 6% who did so the last time Pew Research asked in December 2012. As with many of the platforms and services discussed in this report, young adults are especially likely to use Tumblr: 20% of online adults age 18 to 29 do so. Tumblr usage is also particularly high among urban residents: 16% of urban internet users use Tumblr, compared with 8% of suburban residents and just 3% of rural residents. Over the past four years, almost all of the major social media platforms that are consistently tracked in Pew Research surveys2 have seen a significant increase in the proportion of U.S. adults who use them. Some have witnessed more rapid growth than others. While Facebook remains the most popular social media site among internet users, it was the only platform not to see significant growth among internet users since 2012. Today, 72% of online adults use Facebook, a change that is not statistically significant from the 67% who did so in 2012. Other sites, such as Pinterest and Instagram (which is owned by Facebook), have experienced significant growth between 2012 and 2015. Today 31% of online adults use Pinterest, up from 15% in 2012. 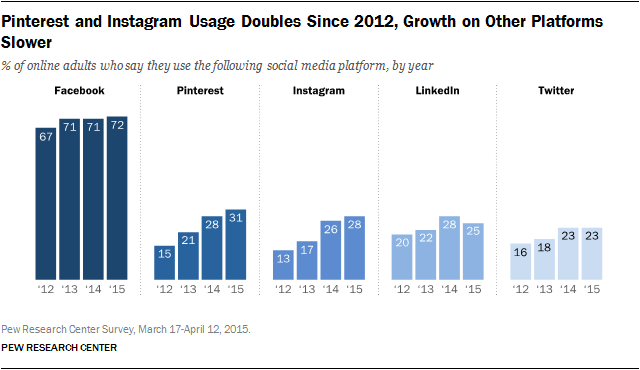 Likewise, 28% of online adults use Instagram, a 15-point increase from the 13% of internet users who did so in 2012. LinkedIn and Twitter both saw significant rates of growth, but at a slower pace. A quarter of online adults use LinkedIn, up from 20% in 2012. And some 23% of online adults use Twitter, a 7-point increase from the 16% who did so in 2012. However, none of these platforms experienced a significant increase in usage between September 2014 and April 2015.